When we were first learning to crochet, we always absolutely marvelled at the way the more advanced “pros” around us were able to make all kinds of shapes and objects using just yarn and their crochet hooks, as if by magic. Until we’d learned and practiced the basic techniques and started to advance a little ourselves, we just couldn’t understand how things like miniature characters or foods were made out of singular strings! Now that we’ve been at it for a number of years, however, structured, miniature, and amigurumi projects are actually some of our very favourites! Lately, we’ve been completely obsessed with the idea of making adorable crocheted fruits, probably because our kitchen is so stocked full of deliciously ripe summer fruits in real life. Just in case you love the idea of making little corcheted fruit projects just as much as we do, if not more, here are 15 of the best (and cutest) ideas, designs, and crochet patterns we’ve come across so far! If you’re going to go to the trouble of making an adorable piece of miniature crocheted fruit from scratch, do you want to make sure that it’s the cutest darn piece of woolly summer fruit you’ve ever seen in your life? 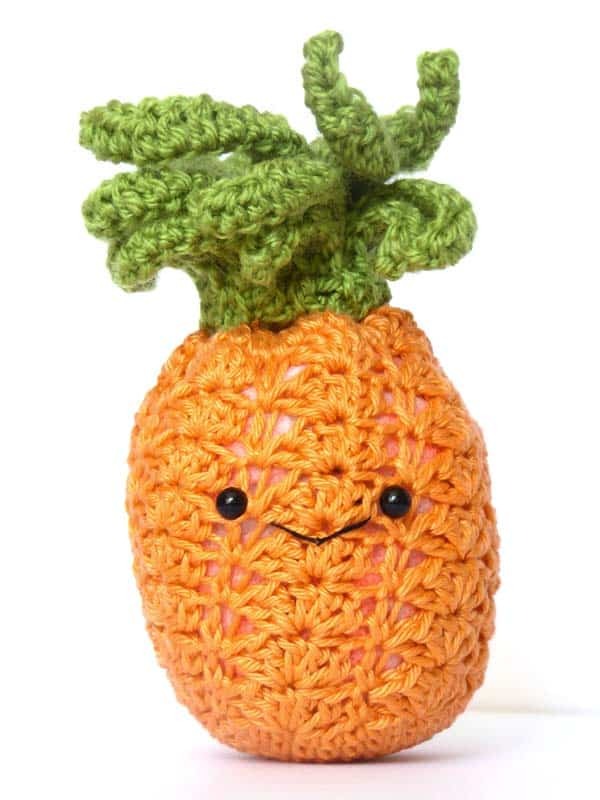 Then we think perhaps this cute stuffed amigurumi pineapple with a super simply hand stitched small and beaded eyes will be right up your alley! Get the full details on Mysterious Cat. Are you absolutely interested in the idea of crocheting yourself some cute fruit projects but you’re also experienced enough that you crochet quite quickly, so you think perhaps you’d rather make something with more parts, a little more detail, or a complete set? 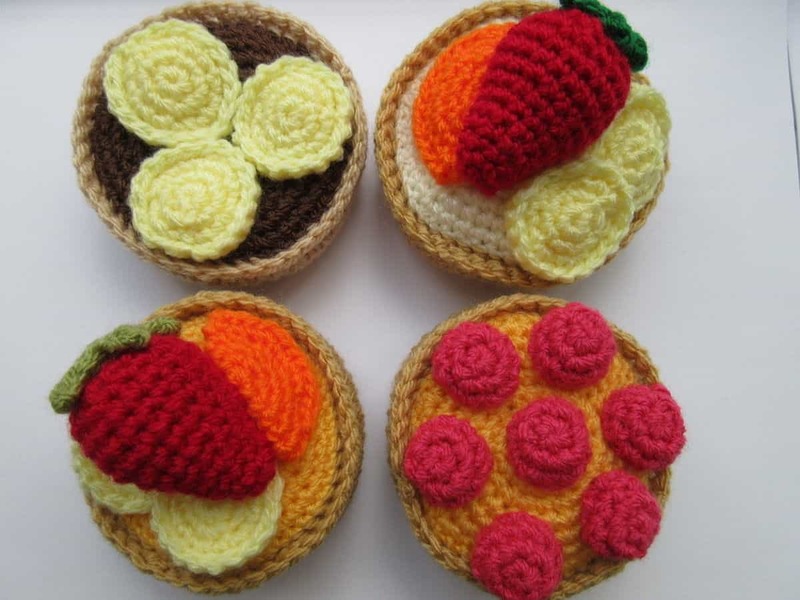 Then we definitely think these adorable yarn fruit tarts featured step by step on Makerist! They’re so fruity looking that we actually started craving berries when we made ours. Now, any crochet enthusiast (or yarn crafting enthusiast of any kind) will attest to how easily recognized stitches are, so there’s no real way to make crocheted fruit look “realistic” per se. That doesn’t mean, however, that you can’t make simple fruit pieces that are more closely inspired by the real thing rather than bearing extra features like little kawaii faces! These adorable, smoothly stitched pears featured on DIY How To are the perfect example of what we mean. Did the idea we just mentioned of making “realistic” crocheted fruit really speak to you but you’ve never really liked pears in real life, so you’re not sure you really want to stitch one either? Well, if you’re more of a berry lover, then perhaps these adorable little crocheted strawberries would be a little more up your alley! Happy Berry Crochet shows you not only how to make the basic shapes and colour changes, but also how to hang stitch some simple berry seed detail at the end. If you’re going to do some fruit themed crochet, would you actually prefer to make something that’s got a bit more of a practical function than a lot of the cute, decorative pieces we’ve shown you so far? Well, if you’re the kind of person who abides by the old adage “an apple a day keeps the doctor away”, then we have a feeling you’ll find this crocheted apple cover outlined step by step on Love Crochet very cool! We made ourselves and our loved ones several of these to stop our apples getting bruise in our lunch bags for work and school. Are you actually quite an experienced crochet enthusiast indeed and, even though you’re still scrolling, you’re still kind of hooked on the idea of making a pineapple even though the pattern we showed you earlier on our list was perhaps a little too simple for you? In that case, we’d definitely suggest taking a look at how DIY How To created this stunningly detailed tropical pineapple using a more advanced stitching pattern. Did you get briefly excited when we started talking about apples earlier on our list because you loved the idea of making an entirely crocheted apple but you’re not sure you’ll have much use for a yarn work apple cover? Then here’s the tutorial you’ve really been looking for! 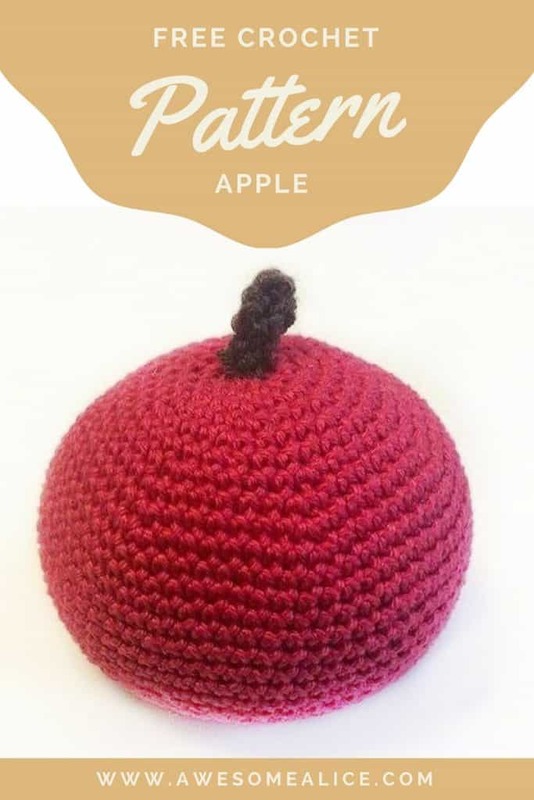 Check out how Awesome Alice made this fantastic (and surprisingly simple) crocheted apple by following a repeating stitch pattern. If you’re going to hand craft any kind of fruit you please, with all the endless possibilities that a ball of yarn and a crochet hook hold, would you rather make yourself something that’s not typically seasonal in your area, just to keep things interesting? Then perhaps you’ll be just as enamoured with this adorable crocheted paopu fruit pattern featured step by step on Crafty Hanako as we were! Learning how to create a star shape is actually a great learning process in shaping stitches. Perhaps you’re actually interested in making crocheted fruit because you love to make DIY soft toys for your kids, so you’re looking for an idea that might be a little more interactive and easy for them to play with? 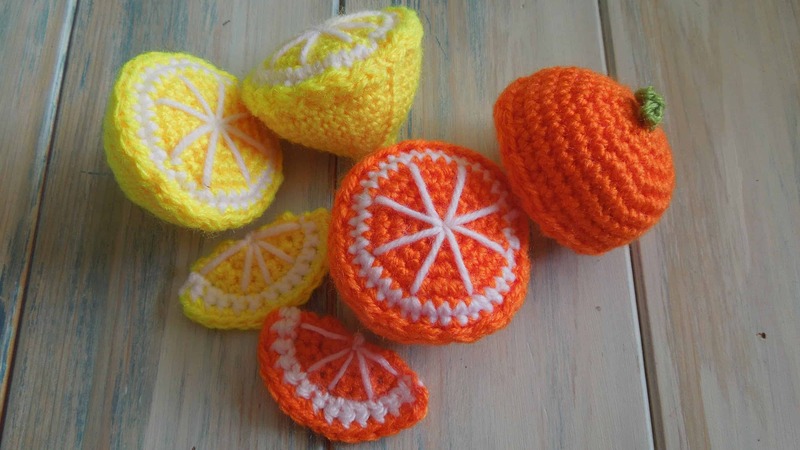 In that case, we’d definitely encourage you to take a look at how Happy Berry Crochet made these fantastic citrus fruit half and slices to loo like pieces or oranges and lemons! 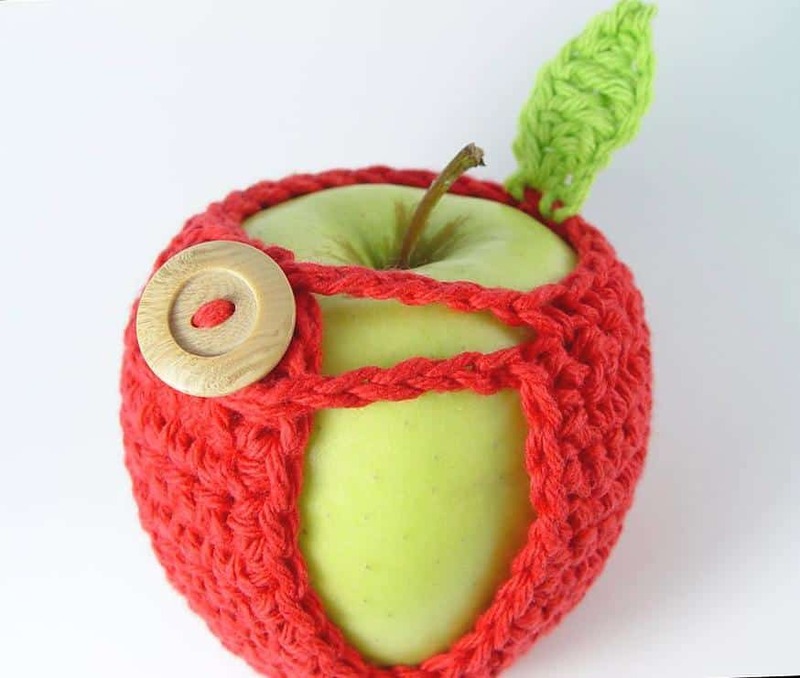 Were you very interested in the idea of making fruit themed crocheted things that have some kind of practical use besides decor, but you’re still just not sure the apple cover we showed you earlier, which was the only other thing with a practical application that we’ve shown you so far, is quite the pattern for you? In that case, we’d definitely suggest taking a look at how DIY How To made these adorable fruit slice pot holders shaped like oranges, lemons, and watermelons. 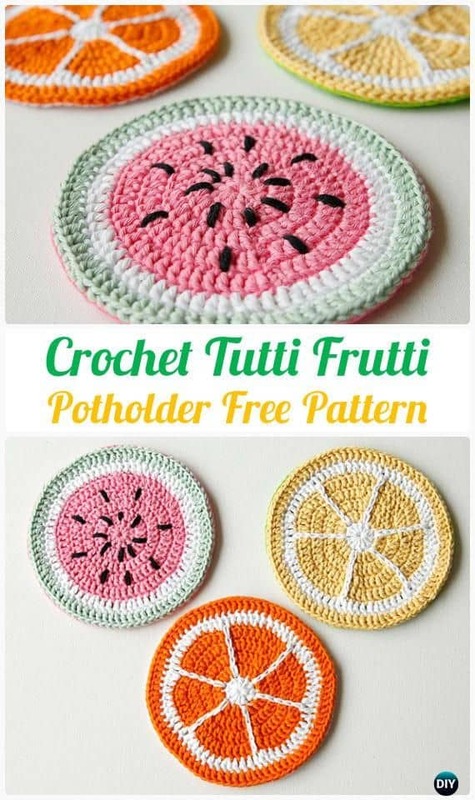 If you’re going to make fruit themed crocheted pot holders, would you love to continue that theme elsewhere in your house and make other things to match or coordinate with it? 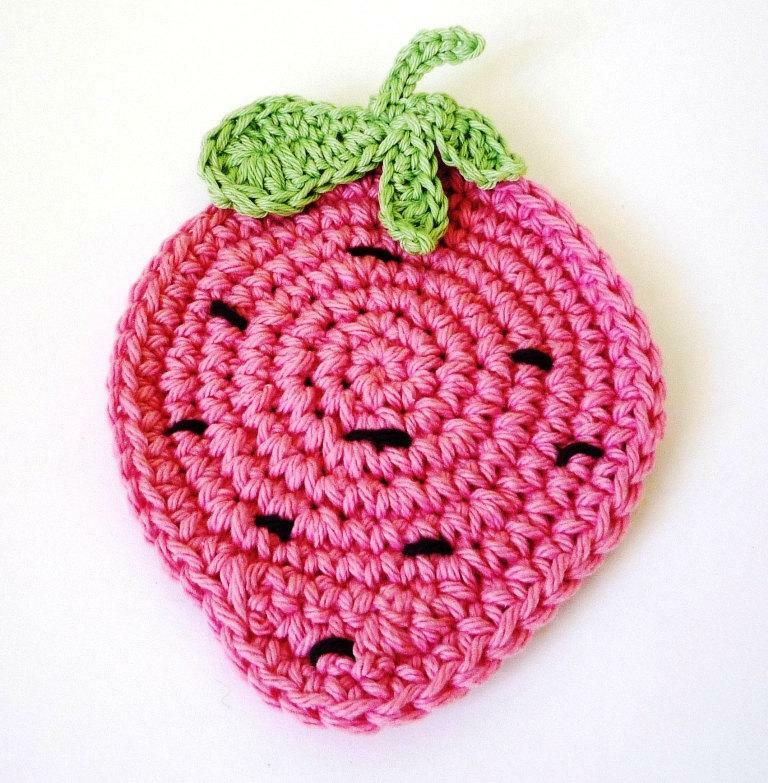 Then we think perhaps you’d get a kick out of these slightly smaller 2D crocheted strawberries from Monika Crochet that make fantastic coasters! Who ever said yarn handicrafts can’t be useful all year round? 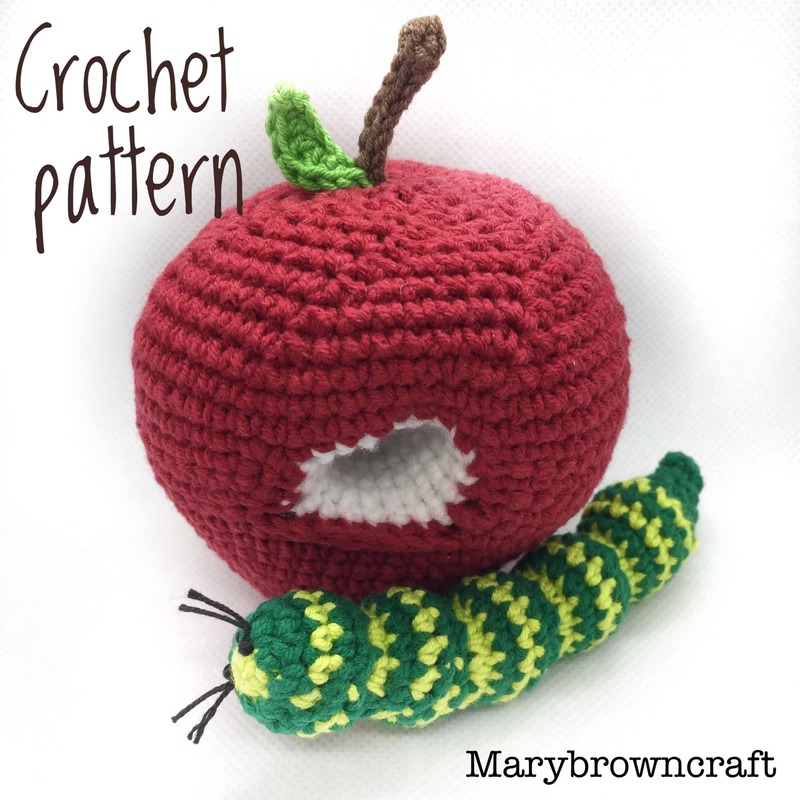 Are you still thinking about how much you love the idea of making a crocheted apple but you’re also still rather intrigued by the concept of making more interactive, soft yarn toys for your kids, so you’re wondering whether there might be a way to merge those two ideas together? In that case, we think you simply must take a look at how Etsy Studio made this adorable apple and worm toy where the worm can actually borrow into the apple like it’s having a snack. 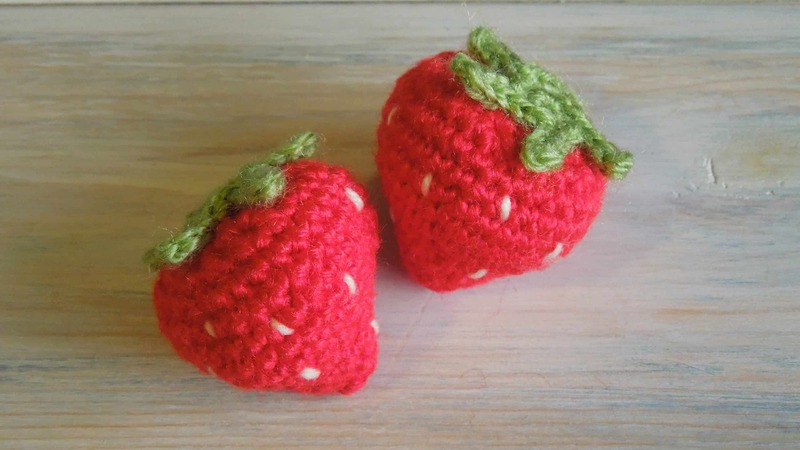 Are you still thinking about how much you love the idea of making crocheted berries but you’ve actually created yarn work strawberries before, so you’re looking for an alternative idea right now? Well, if the idea of making berries that are life sized appeals to you, we’d absolutely suggest taking a look at this simple pattern from DIY How To for making a pair of cherries on a stem. Have you actually been scrolling through this entire list and appreciating each idea… but still finding yourself wishing that there were more amigurumi and kawaii fruit options for you to try out because you just love them so darn much? Then we think you’ll be very pleased indeed to see this fantastic “Johnny Apple” and “Little Mac” parent and baby apple pattern created by Salihan Crafts. We can’t get over how cute the baby’s pacifier is! 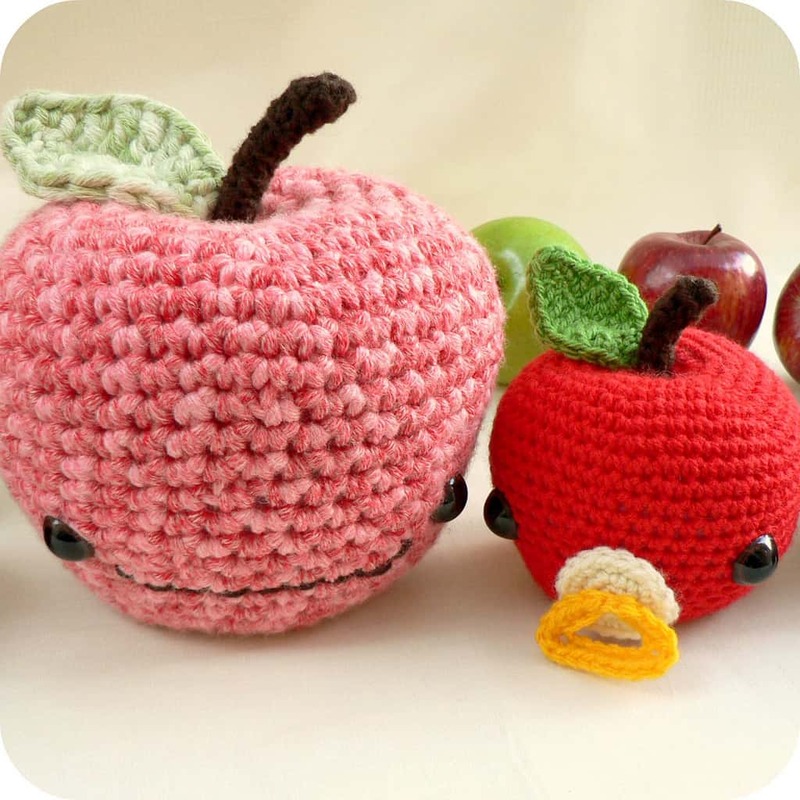 If you’re going to make something as novelty, cute, and silly as crocheted fruit in the first place, would you rather use that as an opportunity to create something really kitschy and funny while you’re at it? 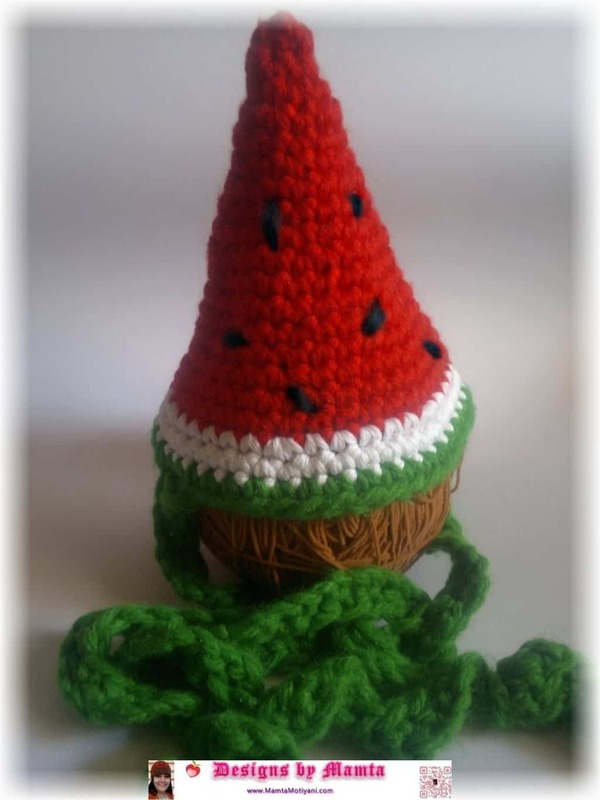 Then we have a feeling you’re going to appreciate the way Designs by Mamta created this hilarious little pointed crocheted hat shaped like a bright, summery watermelon wedge! We actually did make this in real life and we immediately tried it out on our (rather unimpressed) cat for a photoshoot. The results were adorable. 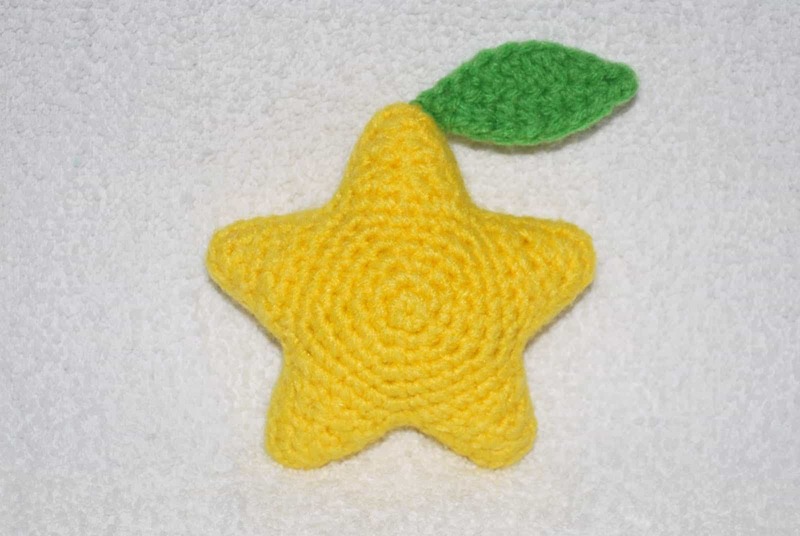 Have you actually made other kinds of awesome crocheted fruits using patterns you really enjoyed, but you don’t see anything quite similar to what you made here on our list? Tell us all about how you did it or link us to the full pattern or pictures of your work in the comments section!